I have a confession to make. I feel like a Benedict Arnold writing this review. I'll tell you why. I have a few brands that I'm a total nerd for: Apple, Verizon, and... Nike. Whenever there is a Nike product, I'm a little biased -- and often give it a positive review unless it really disappoints. I'm doing that now. And I feel like I'm betraying one of my brand-crushes. Sorry, Nike, but your Lady SlingShot series leaves something to be desired. 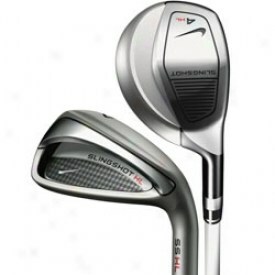 While I understand they have a distinct design in mind for ladies, I could still hold the club and take a couple of swings to see what it felt like. Ugh. Felt cheap. All over. What Nike may have tried to do is create a general fairly-priced club (this review being for a single AW) without a lot of frills -- relying solely on the name and Tiger's strong product placement to sell it. However, it just doesn't match up with some of their stronger items that have come out in the last few years. I'm going to be bold enough to say this -- but it is almost as if Nike gave this "project" to a lesser company that manufactured it for them and Nike slapped their swoosh on it. They just feel that bad. I'm sorry Nike. I know we have had a good past. But to mine own self be true... or something profound like that. You just missed it on this one.